This guide instructs you step-by-step on how to set Admob live as an Ad Network on the ironSource Mediation platform. Make sure you have correctly integrated ironSource’s Interstitial, Rewarded Video or Banner Mediation in your application. To serve Admob’s Rewarded Video, you must have Google Play Services version 9.0.2+ integrated in your app. Replace the “[ADMOB_APP_ID]” with the APP ID value you retrieve in step 3. To access AdMob’s ad inventory through ironSource‘s Mediation platform, you must create an account with AdMob. You can do so here. Note: AdMob requires you to have a valid AdSense and AdWords account. If you don’t have either of these accounts, you can create them during the sign-up process and connect them to your Google account. 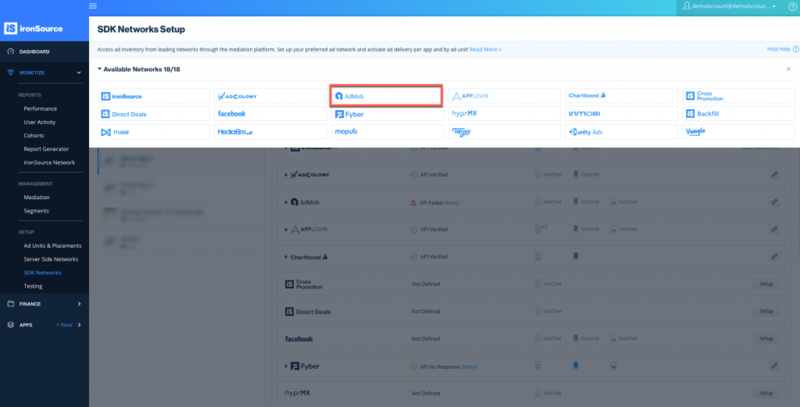 Next, you must add your app and set up Ad Zones in your Admob account. Log into your Admob account. On your dashboard, click the ‘Apps’ button. 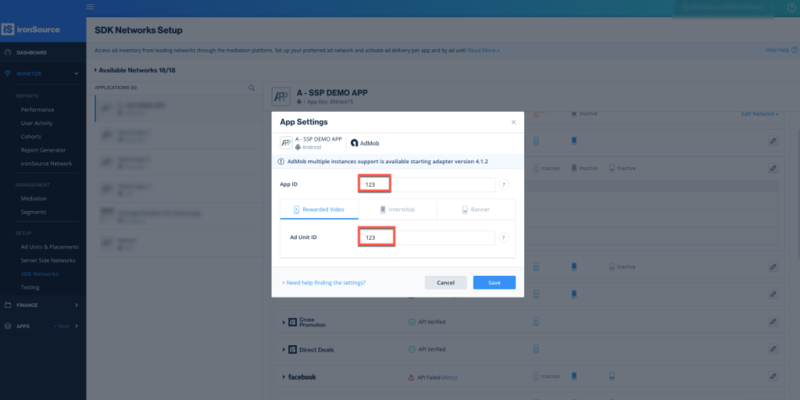 A modal will appear where you can either search for your app, add your app manually or simply select an existing app to monetize. Note: You will need a unique Admob application per platform (iOS + Android), just the same as in your ironSource account. Select Interstitial, Rewarded Video or Banners as your ad unit format and enter the relevant details. Ad Type: You can leave the two boxes checked as we support text, image, video and rich media in interstitials. Ad unit name: we recommend naming the ad unit intuitively so it will be easy to recognize as the ad unit you’ll be serving Admob Interstitials through the ironSource Mediation platform. Ad unit name: we recommend naming the ad unit intuitively so it will be easy to recognize as the ad unit you’ll be serving Admob’s Rewarded Video through the ironSource Mediation platform. Now you will get your App ID and Ad Unit ID, before you exit we recommend saving these for later use. You can click ‘Done‘. Serving Admob’s ads through the ironSource Mediation platform has never been this easy. 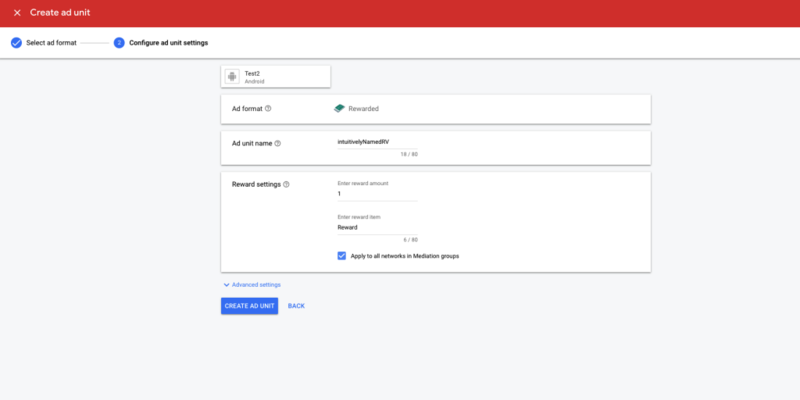 Sign in to your Google account when setting up Admob on the ironSource SDK Networks Setup and we’ll retrieve all the necessary parameters to run Admob’s Interstitials, Rewarded Video and Banners for you! The unique ID assigned to your app on Admob’s dashboard. This is a unique identifier for your Admob account, which allows ironSource Mediation Platform to import performance data from your Admob account to use in reporting & optimization. The unique ID assigned to your app’s ad unit on Admob’s dashboard. This is the unique identifier that specifies the relationship between your account and the ad unit. This is the refresh token the client application already received. Once you obtain this information, you must configure Admob’s Parameters in your ironSource Account. By adding the above information correctly, you will be able to take full advantage of Admob’s ad inventory and reporting data on the ironSource Mediation platform. To retrieve your App ID, go to ‘Apps’ tab on the left side bar on Admob’s platform and click on ‘App Settings’ . You will then see the application’s settings, as well as the App ID. To retrieve your Ad Unit ID, go to ‘Apps’ tab on the left side bar on Admob’s platform and click on ‘Ad Units’. You will then see the application’s ad units, as well as the Ad Unit ID. 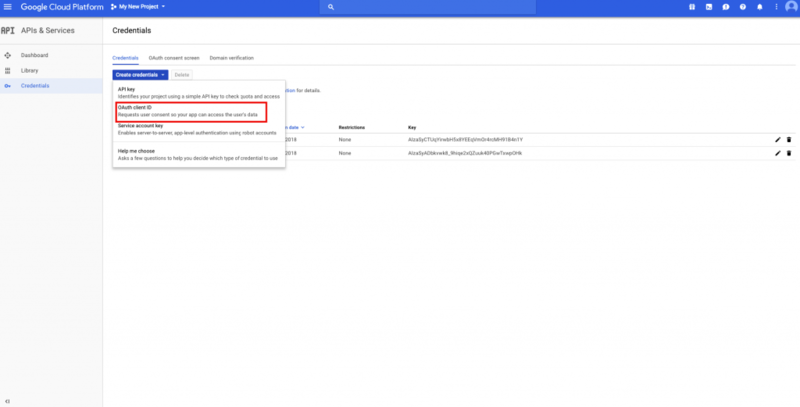 To retrieve your API KEY, you must first create a designated project for your app on the Google Cloud Console. If this is your first time creating a project, you will be asked to agree to the Terms of Service. Provide a name for the project and click ‘Create‘. It may take a few minutes to set set up your new project. Next, go to ‘Credentials‘ in the left sidebar. 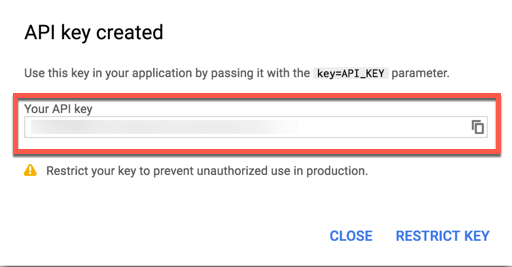 Select ‘Create credentials‘ and click on ‘API Key‘ in the drop-down. 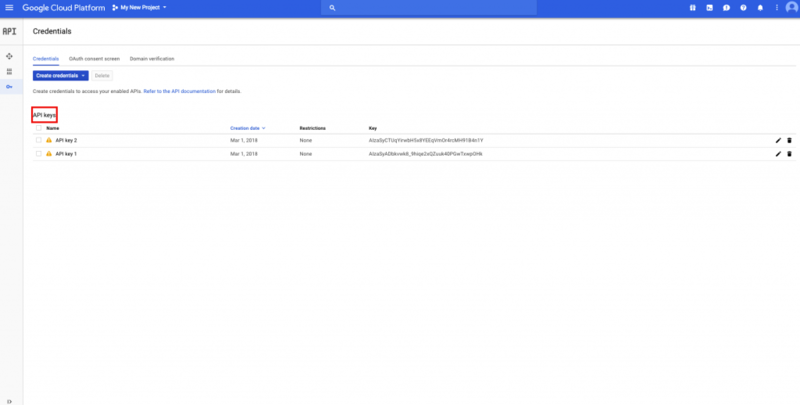 To retrieve your Client ID & Client Secret, go to Google’s API Manager. In the case you are creating a new project for this purpose, provide a Project name in the dialog box that appears and click ‘Create’. To retrieve your Refresh Token, go to the OAuth 2.0 Playground. Once you have all of these parameters, log in to your ironSource account and go to ‘Monetize‘ ➣ ‘SETUP‘ ➣ ‘SDK Networks‘. 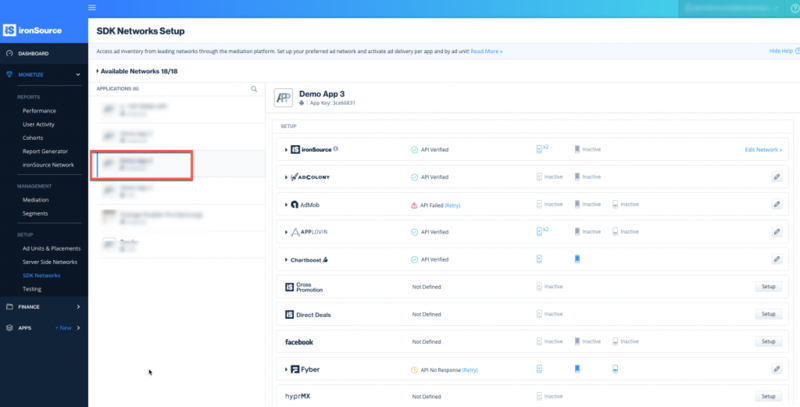 Select Admob from the list of Available Ad Networks and enter the Admob ‘API Key‘, ‘Client ID‘, ‘Client Secret‘ and ‘Refresh Token‘. If you’d like to activate this network in specific countries, you can select these from the dropdown. Click ‘Save‘. 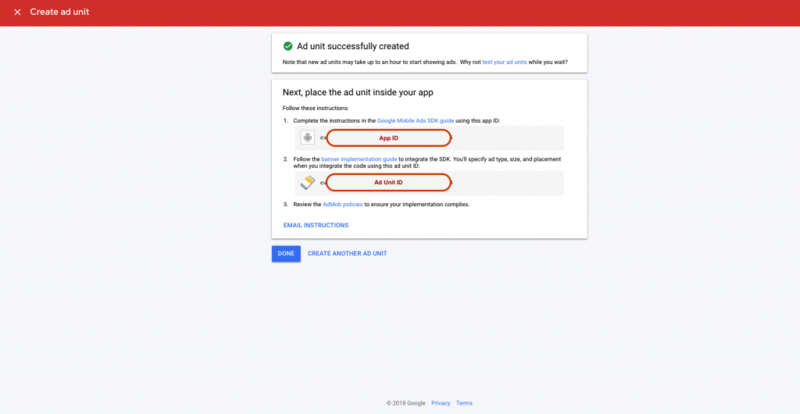 Admob will then be enabled in the Available Ad Networks table. Next, select the app on which you’d like to run ironSource’s Mediation with Admob. Select Admob from the Setup list of Ad Networks and click on the tool Define icon. Then insert the App ID and ‘Ad Unit ID‘ under Interstitial, Rewarded Video or Banner Settings. Set your ad unit of choice status to Active. You will then see Admob as Active for Mediation on your Setup Dashboard. Verify your integration with the Reporting API; this column will check your integration through the Reporting API and return three possible responses: Verified, Failed and No Response. Double check your integration and the information you entered above; then click ‘Retry‘ until you see ‘Verified’. ironSource supports both Gradle dependencies and manual download mechanisms. Make sure the following Maven URL exist in your build.gradle script of your app module (should appear only once for all the adapters). 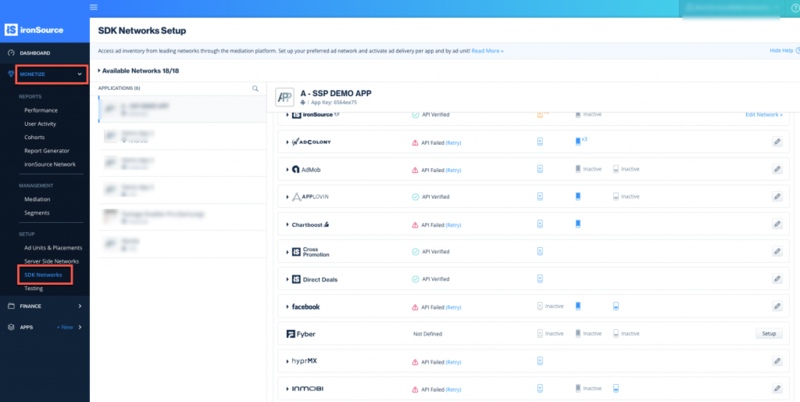 Add the Admob Adapter to your build. You can find the latest Admob Adapter here. Important! The Admob Adapter also contains the Admob jar. You DON’T need to additionally add the Admob jar directly. After you download the Adapter; drop the Admob Adapter jar into the libs folder in your Android Project. Replace the “[ADMOB_APP_ID]” with the APP ID value you retrieved in step 3. Not doing so results in crashes originated with AdMob’s SDK. For more information please refer to AdMob’s guide. The ironSource SDK provides an easy way to verify that your mediation integration was completed successfully. To verify your ironSource and additional Ad Networks’ integration, follow this document. You are now all set to deliver Admob Ads within your application! To leverage additional mediation ad networks, integrate the adapters and follow our integration guides.